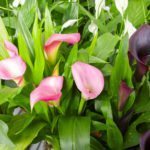 Is it possible for a calla lily to receive too much water? The leaves are turning yellow, flowering tubes are falling off at the base of stem and flower itself looks to be rotting off and even when examined, flower tube comes off the plant from the ground as to be mushy (like rotting). It does sound as if your plant has crown rot. Over watering and poor draining soil can be the cause. It may be difficult to recover the plant if the crown rot has taken hold. Here is a couple of links with more information.